Offering 4 star accommodation on a beautiful beachfront of Penang's northwest coast, Bayview Beach Resort features a choice of spacious rooms and suites overlooking 'Foreigners Rock' or the famous Batu Ferrighi Bay. Just a short drive from Georgetown, the resort is well-appointed in both accommodation and facilities and is surrounded by a number of tourist attractions including Eden Parade Shopping Centre, Japanese Cultural Centre, Toy Museum Heritage Garden and Tropical Spice Garden. Offering 4 star accommodation in Penang's central dining and entertainment precinct, Bayview Hotel Georgetown Penang enjoys an outstanding range of onsite facilities including the famous Three Sixty Revolving Restaurant and open-air Sky Bar. The resort also enjoys easy access to popular tourist attractions including St. George's Church, Cheong Fatt Tze Mansion, the Goddess of Mercy Temple and Penang State Museum. Cheong Fatt Tze - The Blue Mansion is located in George Town, Penang and offers boutique style accommodation in one of the individually themed rooms. This Penang accommodation is one of three award winning UNESCO heritage buildings in the region carrying on the legacy of Cheong Fatt Tze who created this mansion back in 1880, before the turn of the 20th century. Cheong Fatt Tze - The Blue Mansion features free WiFi, a swimming pool, restaurants, parking and more. An old colonial property transformed from its former glory and restored into a stylish property that blends its rich and fascinating history with all the modern comforts, the Eastern & Oriental Hotel offers 5 star suite accommodation within minutes of a range of shopping, dining and tourist attractions with an exclusive variety of onsite facilities. 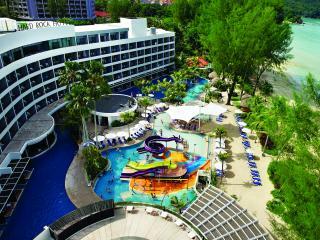 Discovering Penang and its hidden charms are made easy when you stay at Four Points by Sheraton Penang. Renowned for being the food hot spot of Malaysia, Penang also offers visitors picturesque coastlines and beaches and the UNESCO World Cultural site – George Town. 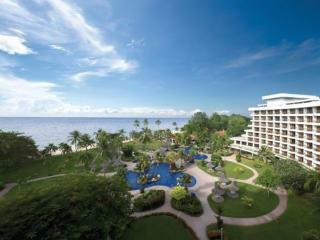 Stay at Four Points by Sheraton Penang to experience where east meets west. Offering 4.5 star accommodation on Gurney Drive, Penang's most iconic boulevard, G Hotel Gurney Penang boasts more than 310 luxurious Deluxe, Executive Rooms and Suites and an outstanding range of onsite facilities. Just minutes from tourist attractions such as Wat Chaiyamangalaram, Dhammikarama Burmese Buddhist Temple and Fort Cornwallis, the hotel enjoys a stylish, modern ambience incorporating accent lighting and designer furnishings. Offering stylish accommodation on the beachfront of Batu Ferringhi, Golden Sands Resort by Shangri-La features an outstanding range of accommodation and onsite facilities just minutes from the UNESCO World Heritage site of Georgetown. 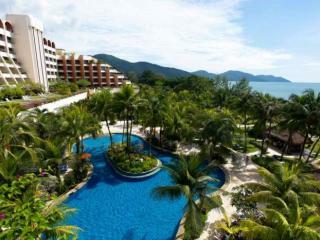 Penang's premier family resort, the Golden Sands boasts three tennis courts, a water sports centre, three swimming pools including a children's pool, slide pool and activity pool, a family entertainment Adventure Zone and much more. Offering a totally unique accommodation experience, the Hard Rock Hotel Penang boasts 250 well-appointed rooms and suites inspired by pop culture icons and pure rock and roll. Adorned with musical memorabilia from the 50s to now, the hotel features Penang's largest free-form swimming pool and is also home to the iconic Hard Rock Café for true Americana style dining. 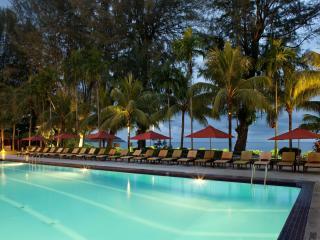 The hotel is also located right on famous Batu Ferringhi Beach, just minutes from a range of popular tourist attractions. Located in the heart of Batu Ferringhi, Holiday Inn Resort Penang enjoys prime position on a pristine beach looking out over the Andaman Sea and Malacca Straits. Conveniently located within minutes of dining and shopping including the Jalan Batu Ferringhi night bazaar as well as popular attractions such as the Bayan Lepas Free Trade Zone, Tropical Spice Garden and the Teluk Bahang Penang Forest National Park. 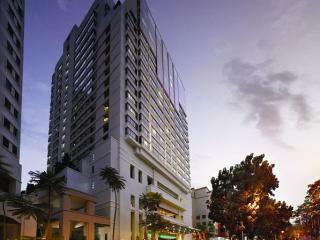 Located in central Georgetown surrounded by a wide range of shopping, dining and tourist attractions Hotel Jen Penang By Shangri-La offers a deluxe range of accommodation with easy access to the beach, Jelutong Expressway, Penang Times Sqaure, KOMTAR, Bayan Lepas Free Trade Zone, Prangin Mall and 1st Avenue Mall. 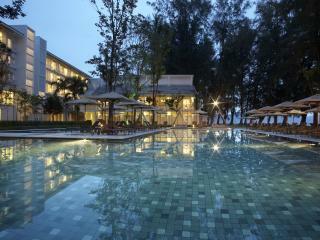 Found at Penang's premier beach location Betu Ferringhi, Lone Pine Hotel offers a luxurious holiday experience. With all the modern facilities and services which an astute guest is seeking, Lone Pine Hotel delivers a fusion of East meeting West. Rooms feature a plunge bath located on the balcony and breathtaking sea views. 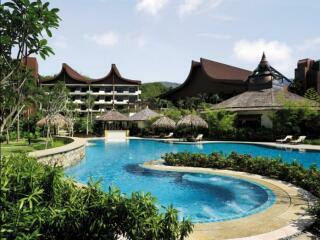 Soak in the sunshine and relax in the picturesque tropical setting of Betu Ferringhi, Penang, Malaysia. Enjoying an enviable location on the beachfront of one of Pengang's most famous beachfront, the PARKROYAL Pengang Resort offers 4 star accommodation on Batu Ferringhi Beach just minutes from a range of shopping, dining and attractions including the night markets, shopping, Butterfly Farm and much more. This George Town accommodation offers a fantastic option for those who want to discover this UNESCO World Heritage site, Seven Terraces Hotel boasts boutique rooms ideal for couples or small families. This Penang hotel features an onsite restaurant and bar, a swimming pool, free WiFi, parking and more. Seven Terraces Hotel is made up for converted terrace houses to create an elegant inner city hotel. Offering 5 star accommodation on the picturesque shoreline of famous Batu Ferringi Beach, Shangri-La's Rasa Sayang Resort & Spa boasts a deluxe range of rooms and onsite facilities including the exclusive VIP benefits for all guests staying in the Rasa Wing. Surrounded by ancient rainforest, the resort is just minutes from popular attractions such as the Penang Cultural Centre, Tropical Spice Garden, Toy Museum Heritage Garden and the Eden Parade Shopping Centre. A fascinating island holiday destination steeped in history and natural beauty on the Malaysian peninsula offering peaceful accommodation close to a range of tourist attractions and architectural icons.